Bel appartement ensoleillé au 4ème étage d'un bâtiment français du 19ème siècle avec un ascenseur et code de sécurité. Cet appartement récemment rénové est idéal pour votre visite à Paris. Il est très confortable, avec une chambre séparée, WC séparé. La cuisine est entièrement équipée pour cuisiner à la maison. Le salon dispose d'un canapé-lit qui est un vrai grand lit. L'équipement: TV ultra plat, chaîne stéréo, ipod gare, internet sans fil. Un bureau dans la chambre permet des tâches d'affaires. Pour vos objets de valeur un coffre-fort est à votre disposition. Un grand et moderne douche. Une machine à laver / sèche-linge et d'un sèche-cheveux. Un ventilateur de la tour est à votre disposition pour l'été. Toutes les fenêtres sont munies d'une balançoire spéciale, pour ouvrir partiellement la fenêtre du haut afin de renouveler ou de rafraîchir l'air pendant votre absence. La fenêtre de la chambre a des volets et les stores autres. We stayed in the apartment for 5 nights and due to location and the Metro we were able to visit most of the major sights in Paris and Versailles. The shopping nearby is excellent and we would definitely stay in it again. My family of 4 stayed here for 5 nights in July. The location is ideal, with plenty of restaurants and stores within a two block radius, and a short walk to most major Parisian sights. The apartment is well stocked, including an easy to use washer/dryer. We loved the long French windows that opened fully to let the breeze and the sounds of the street in while we were awake, but closed firmly and kept the apartment quite quiet at night. I would recommend this rental to other families. My wife and I stayed for 6 1/2 weeks and had a fantastic time. We had visited in Paris three times before but had only stayed in hotels. 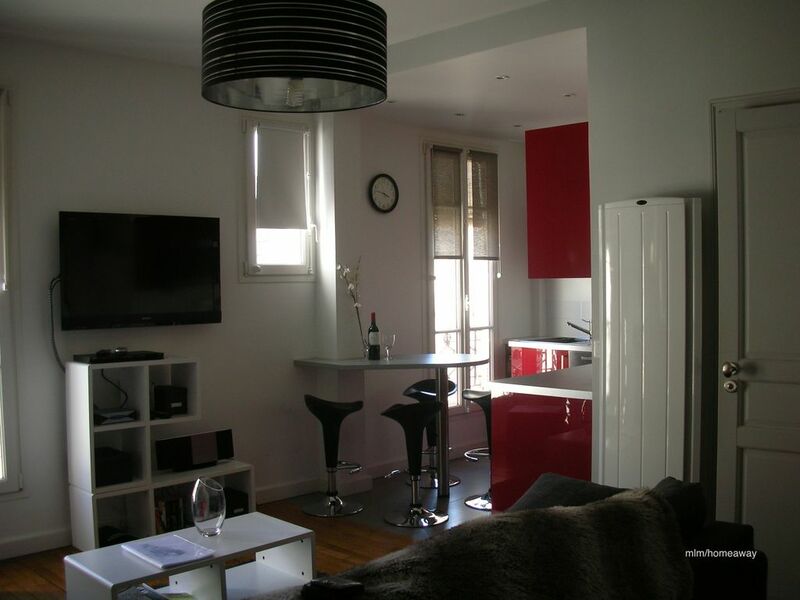 We wanted to get a feel for living in Paris - the apartment was a perfect way to do that. The apartment has everything you need for cooking and entertainment. The WIFI worked well and the TV is quite nice - we mostly watched news on France 24 (English) and BBC to keep up with the outside world. Ben from Roussel's Apartments met us the first day and gave us a tour of the apartment. He was very personable and speaks excellent english. The clothes washer worked well though the dryer function is not what Americans are used to (the dryer is not vented to the outside and works more like the way a dishwasher heat dries your dishes). You will need to hang your clothes in doorways to dry. We did not learn until the last week that there were spare linens and towels in plastic boxes under the bed (HINT: read the apartment information folder under the TV front to back early into your stay). There was easy Metro access to everywhere we wanted to go. We bought NAVIGO Découverte cards at the Tabac across the street - 5 euros one time for the card + 21 euros per week for unlimited Metro, RER (from CDG and ORY), Bus and some trains ( Fontainebleau , Versailles ). I used the Ulmon Pro (no adds) map app on our US smartphones with the downloaded Paris area map. The phone GPS will locate you on the map wherever you are with no need for wifi or a data connection and does not need a european smart phone account. We went to the farmer’s market on Boulevard Raspail every Tuesday, Friday and Sunday for fresh fruit, greens and the occasional roto chicken. Canal Saint Martin from Metro Stalingrad to Metro Bastille. Musée Marmottan Monet, Memorial des Martyrs de la Deportation, Musée de Cluny, Musée Gustave Moreau, Musée Rodin, Musée Picasso Paris, Musee national des Monuments Francais. Do not miss the 11:00 Sunday Mass at Saint-Sulpice every Sunday - the organ is magnificent! To sum it all up, we had a wonderful time in Paris; and Muriel’s apartment was a great home base. We plan to be back for another month in this apartment next year! A fantastic base for your stay in Paris. Clean, secure, well equiped and comfortable. A typical Parisian building - but with a lift to the front door - in a typical Parisian street with bistros and brasseries (make sure you book a table at L'Epi Dupin), boulangeries and patisseries all downstairs and a fantastic regular food market just down the street and Bon Marche just around the corner. Several Metro stations within minutes walk, but you'll be surprised where you can reach (and what you'll 'see on the way) by walking. Noise? We slept soundly every night in a very comfy bed. The service provided by Muriel and her team was excellent and everything went smoothly. A small note: it has the biggest shower in any apartment in Europe we've stayed in. Cozy apartment in perfect location! This apartment was perfect for our month-long stay in Paris. It was close to two Metro lines with great restaurants, shops and bakeries right outside our front door. We were just a block away from Au Bon Marche and within easy walking distance to museums and markets. The apartment was clean, safe and quiet...and well-appointed with everything we needed for our stay. I have already recommended it to friends planning a visit to Paris! We had a fabulous week at this lovely apartment. It was in easy walking distance to a number of very lovely restaurants. A few blocks away is the Metro, so you are quite close to navigating Paris very easily. The apartment was cozy and quiet, just a block away from a lovely Marketplace where you could buy anything. And a lovely grocery store very close. The apartment has all the information that you would need to know about the area and how to navigate the apartment. Bed was very comfortable, I wold recommend this place without any reservations. Cette zone appartient au cœur de Paris. Il est très proche des sites les plus célèbres à visiter à Paris entre Saint Germain des Prés: le jardin du Luxembourg, Tour Eiffel, Musée d'Orsay, Musée du Quai Branly, Sanit Sulpice Eglise. Cet emplacement offre une vaste gamme de boutiques de mode, restaurants, produits alimentaires traditionnels, marchés en plein air, des théâtres, des cinémas, et très proche 'le Bon Marché. Parkings et cyclables stations disponibles à côté. For long term stays, a cleaning can be organized every fortnight (28€ per hour) Check in and out flexible from 8 a.m to 8 p.m, otherwise 50€ is charged SAFETY DEPOSIT : on arrival my manager has the agreement with his company to take your imprint credit card (agreement given with the electronic telebanking for distance selling), a fee of 1€ would be charged to validate . Or 1000€ of deposit can be paid via Paypal refunded after check out or in cash if you prefer (in Euros or dollars) and given back after check out. Check out cleaning, electricity, water, wifi charges included.